Building stairs out of any material is a tedious process that requires ample planning and preparation. 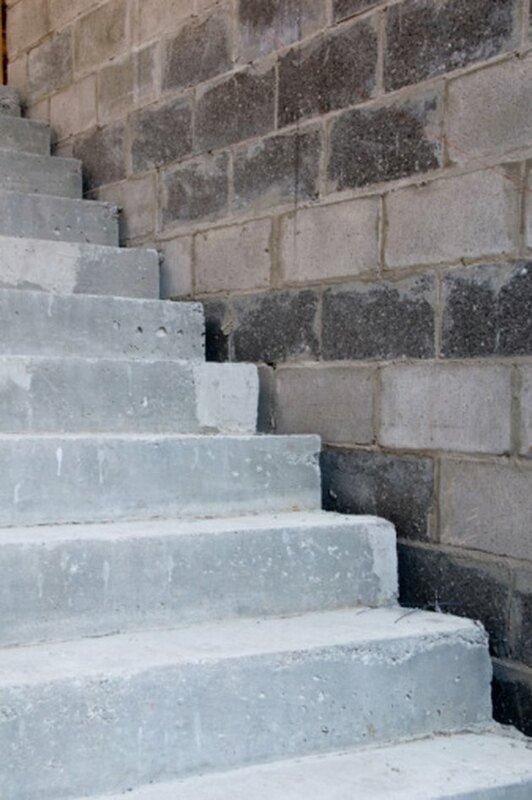 A set of stairs made out of pavers requires building a base structure out of concrete blocks. The blocks provide a stable and level surface for the pavers which are adhered to the concrete blocks using mortar. The pavers are adhered to the face of each step, the sides of the structure and the top of the structure to mask the presence of the concrete blocks. Laying out pavers onto existing concrete steps follows a process similar to building other kinds of stairs. Dig a hole for the area to house the stairs to a depth of 3 inches. Compact the ground in the hole with a hand tamper, a long pole with a wide-metal base and two handles on the side. Erect a tower of concrete blocks against the wall of the structure up to the base of the structure. Measure the distance from the top of the block tower to the base of the structure. The distance must be equal to or slightly greater than the height of the pavers plus 1/4 inch for mortar and 1 inch for a crushed gravel base. Adjust the depth of the hole as needed. Pour a 1-inch crushed-gravel base into the hole. Compact the gravel with the tamper to obtain a flat surface. Check the level of the surface of the gravel from side to side and front to back. Rebuild the block tower to verify that the distance between the top of the tower and the base of the structure is now at the height of the pavers plus 1/4 inch minimum. Erect the basic structure for the stairs by laying out concrete blocks along the base of the hole. Add one row for each step until the entire step structure is created. Measure and cut pavers to equal the vertical height of each step. Press the pavers into position against the face of each step to verify the cuts are accurate. Leave the pavers in place momentarily. Lay pavers along the top of each step extending from the back of the step to a 1-inch overhang on the front of the step, which puts the pavers 1-inch past the face of the vertical pavers left standing from Step 5. Position the pavers so that the sides overhang the edges of the concrete blocks by the measurement of the height of the pavers plus 1 inch. Cut the pavers as necessary to fit the structure. Remove all the pavers, keeping them organized by their position on the stairs. Mix mortar and water in a bucket to a consistency of peanut butter. Spread the mortar onto the backs of the vertical pavers to a depth of 1/4 inch for the face of the steps. Press the pavers into place with the cut edge facing up, working from the top stair down. Spread mortar onto the backs of full pavers for the sides of the structure. Build one row at a time, working from the base of the sides of the concrete blocks to the top. The pavers must be flush with the top edge of the concrete blocks. Cut the pavers as necessary to fit the structure. Spread mortar onto the backs of the pavers to sit on top of each step. Place the pavers so that any cuts are pressed against a vertical surface. Work from the top step to the bottom step. Allow the mortar to set for 24 to 48 hours before allowing for any foot traffic. John Walker started a writing career with technical manuals in the Army in 1995. He continued writing manuals and standards of operating procedures for various employers specializing in information technology, office products, auto mechanics and home repair. He graduated with a degree in Global Business Management in 2010.